This was originally a low-carb hash that I make for dinner on busy weeknights. 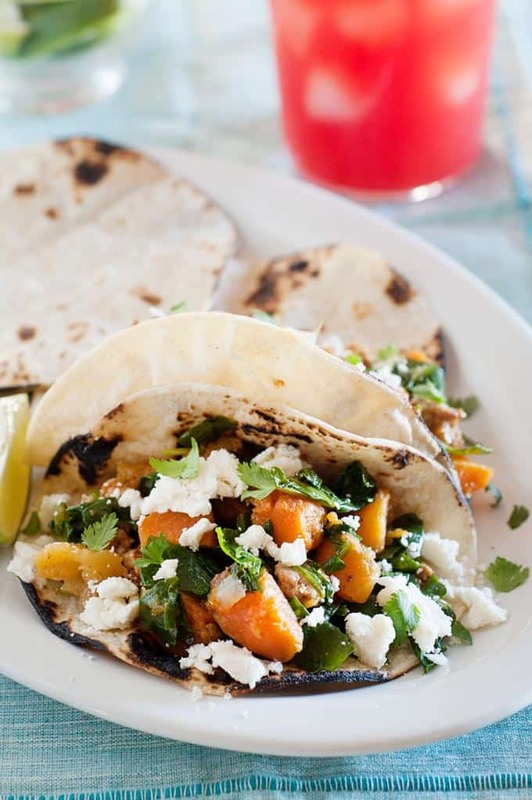 The combo of smoky chorizo and mild butternut squash flavor, you can’t go wrong! 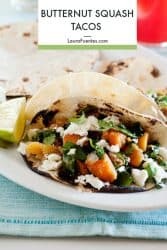 It’s hearty and so good I thought it deserved to be served in a warm tortilla, topped with goat cheese and placed in the Taco Tuesday Cookbook! And after you taste these, you’ll know exactly why. These Chorizo and Butternut Squash Tacos are made fast in the cast iron skillet with chorizo being the star ingredient. What exactly is chorizo? A perfectly seasoned and delicious pork sausage used in many Mexican and Spanish dishes. In other words, if you’ve never had it, you need to try it NOW in something you know you’re going to love? Yes, I was talking about tacos. There are two types of chorizo: fully cooked and smoked and ready to cook in the casing. For this recipe, we will use the ready to cook chorizo that you’ll find in casings. It feels like regular sausage. Like you saw in the video, you’ll have to remove it from the casing but doing that is no problemo. I’m also saving time with pre-cubed butternut squash, which you can find in most fresh produce sections at the grocery store. It cuts both the prep and cook-time in half! You can use frozen butternut squash cubes -making this ultra convenient. You know, whatever works best and feeds your hungry family faster, right?! 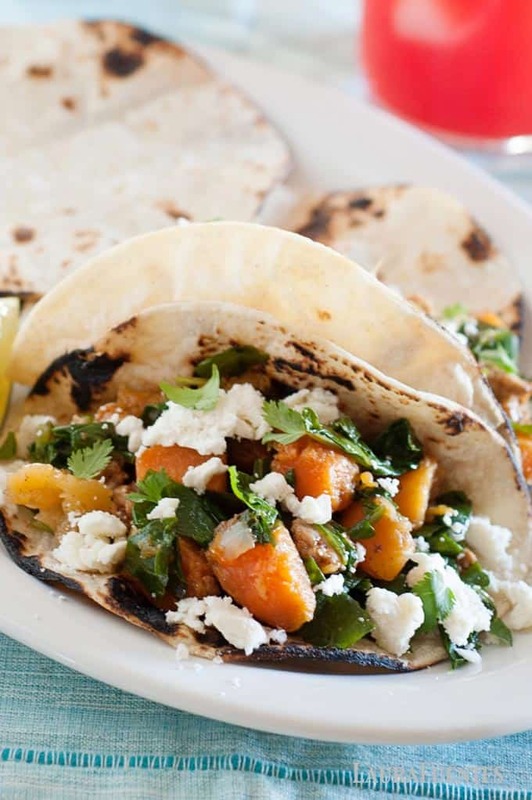 The fat and spices from the chorizo really amp up the mild sweet flavors of the butternut squash. It’s the perfect ying and yang in a taco recipe. I like to add chopped kale for a little more texture and added nutrition. If kale isn’t a favorite, swap it with finely chopped spinach. It’ll be just as delicious and nutritious. Hold up, before you go, we need to talk about cheese. For these tacos, I prefer something tangy and creamy to balance the spicy, smoky flavors. Goat cheese works perfectly here but if you’re a Mexican cheese fanatic, use Cotija cheese too. I always have some in my fridge. 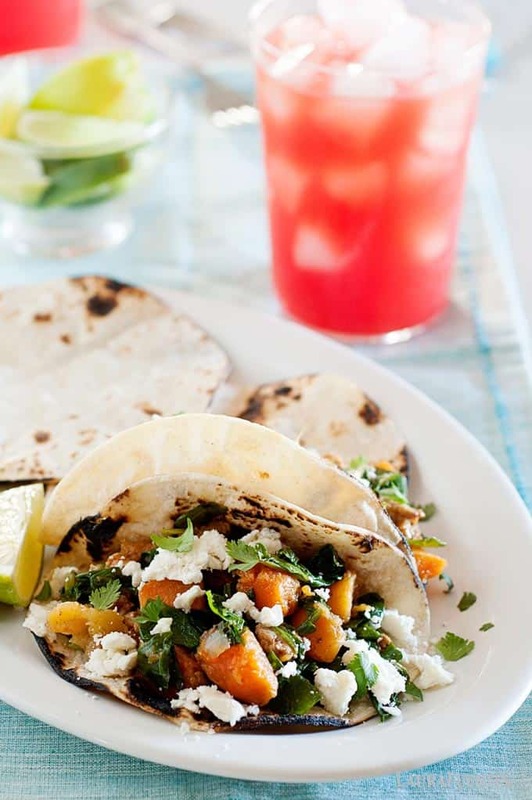 Ready to give to give these tacos a try? 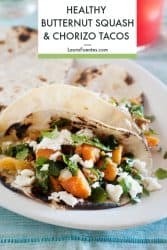 Then check out the Taco Tuesday Cookbook for the complete recipe and details and make sure to keep up with all the latest Taco Tuesday action on my Youtube Channel. See you around!